José López-Montes [ES/CH] is a composer, improviser, visual musician, pianist and researcher. 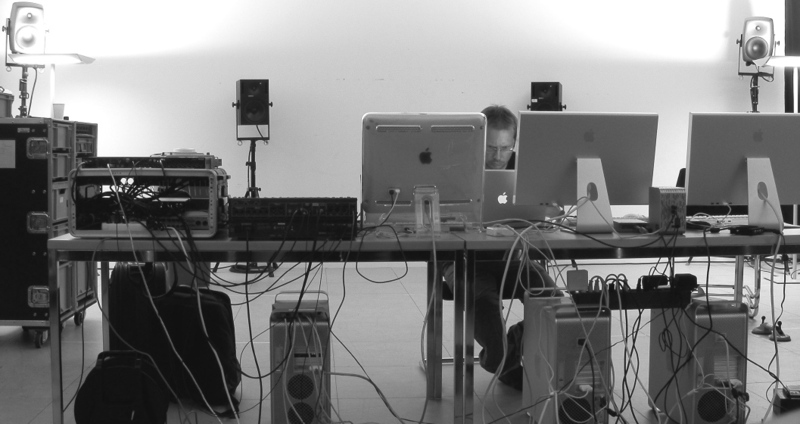 His works explore the interaction between algorithmic processes, improvisation, electroacoustics and synthesis of video integrated in with instrumental composition and dance. He has been guest composer at the Zurich Institute for Computer Music and Sound Technology, the Daegu International New Media Art Festival, the Institut International de Musique Electroacoustique de Bourges and the Museo Nacional Centro de Arte Reina Sofía in Madrid. His piece Le Ton-beau de Frank (2003) was awarded and published in Synästhesie und Farblichtmusik, a project by the Zurich University of the Arts, the Berlin University of the Arts and the Hanns Eisler School of Music Berlin. Since then, his visual music has been published and documented in various books and recordings on synaesthesia and music. López-Montes is professor of harmony, improvisation and mathematics at the Victoria Eugenia Conservatory of Granada. Currently he is developing techniques for artificial creativity applied to composition through metaprogramming based on the evolution of musical genotypes, in collaboration with the Artificial Intelligence Department of the Granada University. 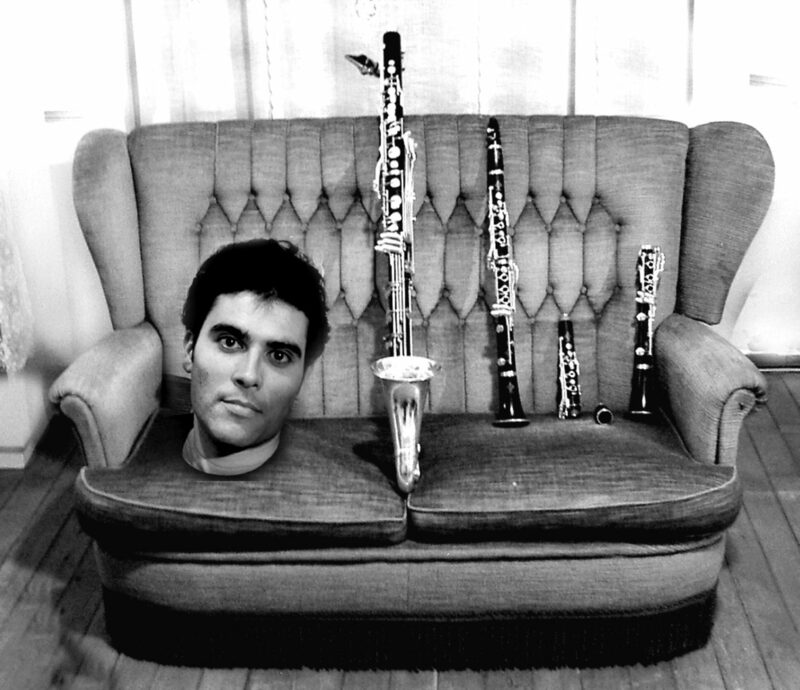 Carlos Gálvez [ES/NL] is a clarinetist specialized in contemporary music and bass clarinet. His musical interest goes from written music from 20th to 21st centuries, developing new repertoire working closely with young composers and improvisation projects. After his musical education with Harry Sparnaay at the Conservatorium van Amsterdam (1995-2002), Carlos co-founded several groups, like Insomnio Ensemble (clarinetist from 1998 to 2010), N Collective and DUOMETRIE (bass clarinet & percussion). Carlos collaborates with ICTUS Ensemble, ASKO-Schoenberg Ensemble, Nieuw Ensemble, musikFabrik, Ives Ensemble, Klangforum Wien, Trio Arbós and Ensemble RESIDENCIAS, working under conductors and composers like Emilio Pomarico, Peter Eotvos, Reinbert de Leeuw, Stefan Asbury, Peter Rundel, Beat Furrer, Gerorges-Elie Octors, Oliver Knussen, Brian Ferneyhough, Gyorgy Ligeti, Pierre Boulez, Helmut Lachenmann, Franco Donatoni, Luca Francesconi, Bruno Mantovani, Wolfgang Rihm and Tom Johnson. He has performed at many international festivals and has been soloist with the Nieuw Ensemble, Klangforum Wien, Ensemble Espai Sonor and Insomnio Ensemble. In 2000, after several working sessions with Pierre Boulez, Carlos Gálvez performed for the first time the version for bass clarinet and live electronics of Dialogue de l’ombre double. From 2008-2011, he has been teaching a bass clarinet seminar at the Vigo Conservatory in Spain. 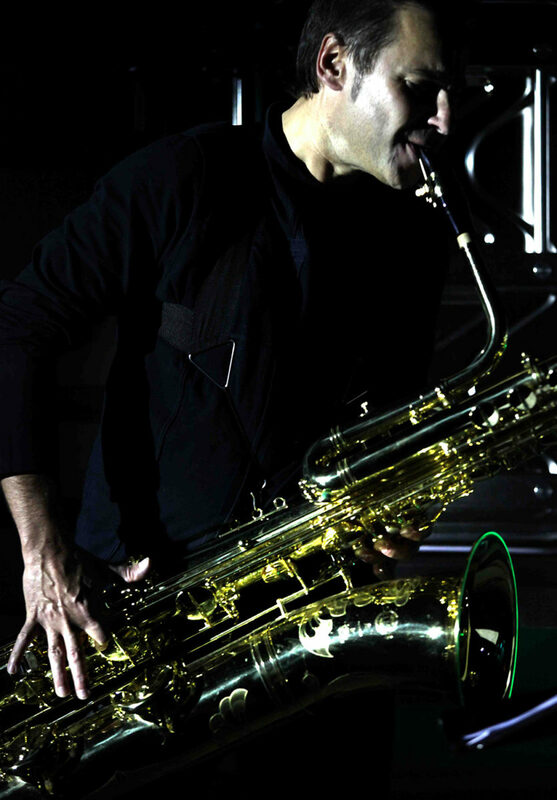 Josetxo Silguero Gor­riti [ES] is, above all, an artist com­mit­ted to the cre­ation of con­tem­po­rary music, pre­sent­ing in his sonic pro­pos­als the inter­ac­tion of his sax­o­phones with elec­tron­ics, spa­tial­iza­tion and video creations. A very expe­ri­enced per­former with broad musi­cal inter­ests, such as sym­phonic, cham­ber, opera, elec­tronic, rock, jazz, improvisation, Silguero com­bines his own solo con­cert tours with his per­for­mances for var­i­ous musi­cal groups. Amongst these are the Sym­phonic Orches­tra of the Basque Coun­try and the Guer­rero Project, the Madrid-based group of soloists who host the series Concier­tos al Límite – Música de Hoy (Con­certs on the Edge – Today’s Music). He is also the founder and artis­tic direc­tor of the group Ensem­ble Oiasso Novis and a member of the Sigma Project Quar­tet. Silguero has per­formed his sonic projects in Ger­many, France, Britain, Italy, Switzer­land and Canada as well as at the most impor­tant Span­ish fes­ti­vals and musi­cal events, such us those organ­ised by Cib­er­art in Bilbao, the Centre for the Dif­fu­sion of Con­tem­po­rary Music at the Queen Sofía Arts Centre of the National Museum in Madrid, the Elec­troa­coustic Music Board in Cuenca as well the COMA Fes­ti­val and the “Punto de Encuentro” Inter­na­tional Fes­ti­val of Elec­troa­coustic Music in Madrid, the Quin­cena Musi­cal Fes­ti­val in San Sebas­t­ian, the ENCON­TRES in Palma de Mal­lorca, the SINKRO Fes­ti­val in Vito­ria and the Matinées of the Sym­phonic Orches­tra of the Basque Coun­try. Akane Takada [JP/NL] is a Japanese pianist living in The Netherlands. She graduated at the Tokyo College of Music, the Royal Conservatory Den Haag and the Rotterdam Conservatory, master in piano. She has studied with Ellen Corver, Aquiles Delle VIgne and Stéphane De May. As a soloist she has been awarded with the first prize of the Prix de Harmonie 2011, performing the Triple Piano Concerto by Beethoven, together with the Codarts String Orchestra under the direction of Arie van Beek at De Doelen, in 2010. She has also performed the Scarlatti sonatas in a broadcasted concert at the Anton Philipszaal. Her master research includes contemporary piano repertoire, specially the piano works by Stockhausen with Ellen Corver. In 2009 she began her studies at the Ligeti Academy, instructed by ASKO | Schoenberg Ensemble, where she specializes in ensemble works with directors and composers such as Emilio Pomarico, Reinbert de Leeuw, Louis Andriessen and Brian Ferneyhough. She has developed her musical skills further and has learned to play koto [traditional Japanese instrument], Javanese gamelan and toy piano. 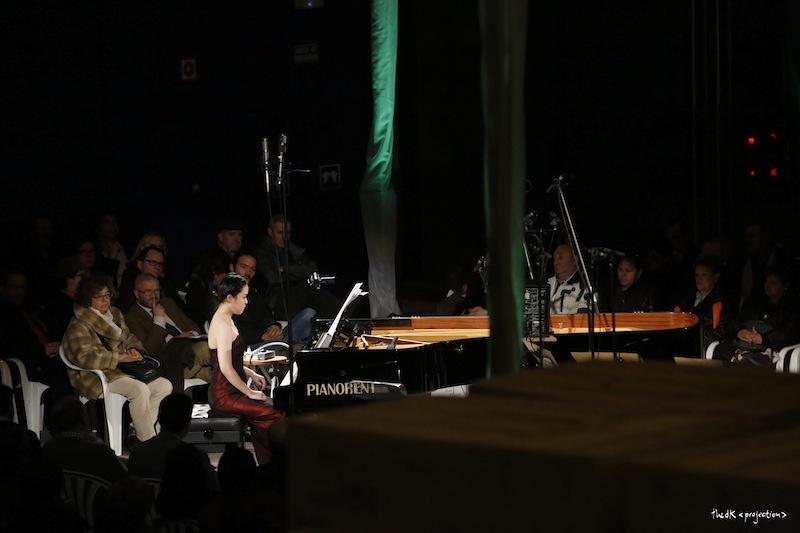 She is also active premiering works by living composers at international music festival, as well as giving master classes. José María aka ‘JM’ Santandreu [ES/AT] is currently one of the most influential clarinet players due to his characteristic, profound sound. His quality as a performer, as well as his audiovisual projects, completely new to the clarinet world, has been praised by specialized critics. His version of the Sequenza for clarinet by Luciano Berio has been included at the discography of Official Center of Luciano Berio Studies in Italy. His performances has been broadcasted at national media. He studied at the conservatories of Valencia and Vienna and has participated as a soloist in several chamber ensembles, as well as in diverse national and international competitions. He has collaborated with international soloists from the Berliner Philarmoniker and the Wiener Philarmoniker. Formerly clarinet soloist of Orquesta de Cámara de Valencia, he is the clarinet soloist of Universal Symphony Orchestra and collaborates with many other orchestras and ensembles. He is also a member of Ensemble d’Arts, premiering pieces for clarinet and electronics, as well as pieces for ensemble. Ralph Raimund Krause [DE] grad­u­ated in 2001 from the Acad­emy of music Hanns Eisler in Berlin, where he had been a stu­dent of Peter Vogler. Until 2003 he con­tin­ued taking classes in Dres­den with the renowned cel­list Peter Bruns, obtain­ing a Konzertexamen degree. His spe­cial inter­est in con­tem­po­rary music led to engage­ments with musikFabrik NRW, ensemble ais­the­sis Heidelberg, Ensemble Res­o­nanz Hamburg, Kammerensemble Neue Musik Berlin, among others. In 2004 he took a posi­tion in the Sym­phonic Orches­tra of Castile & León, Val­ladolid. Today Ralph Krause is work­ing as prin­ci­pal cel­list of the Loh-Orchester Sondershausen in Thuringia, Germany.